Kanye West just gifted Kim Kardashian a Lorraine Schwartz ring Worth $5 Million. Kim Kardashian is walking around with over $5 million dollars on her fingers and it’s all thanks to her hubby Kanye West. 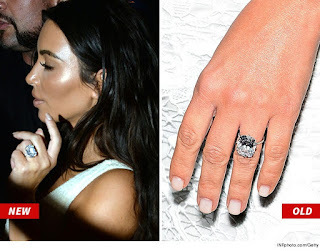 Kanye gave Kim a massive diamond rock…and it’s a “just because he loves her” gift. The new Lorraine Schwartz rock is 20 carats! That’s 6 carats bigger and cost 3 times more than her $1.3 million engagement ring. Sources close to the jeweler say the emerald cut rock is a type IIa diamond, which means it’s pretty rare and close to flawless. We pray she gets an insurance before someone cut her hands off... Lolz.